Here is a continuation of the short presentation of the editorial workshop equipment. 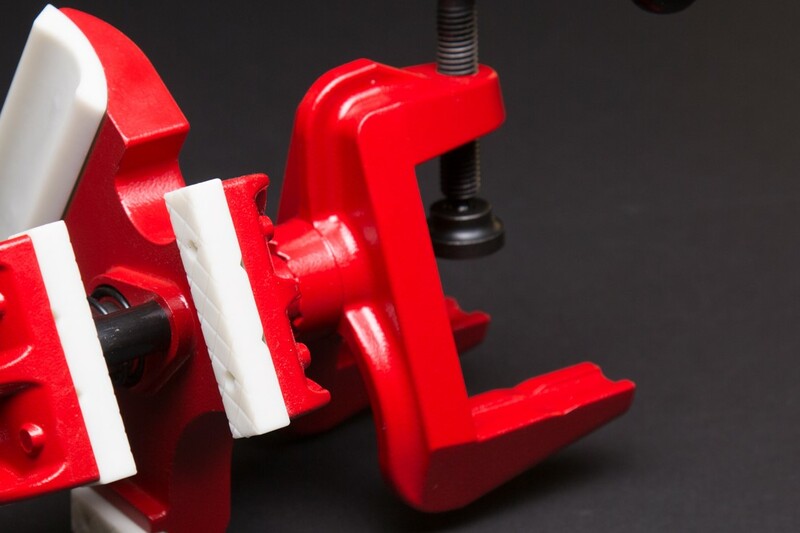 This time, the vice, and more precisely, the Modify workshop vise. Yes, by the same company that produces spring powered and electric replicas and very good quality tuning parts. No one need to be convinced that the need to organize your workplace is a very sensible idea. One of the organizing elements, and consequently making work easier is vise shown on the photo above. 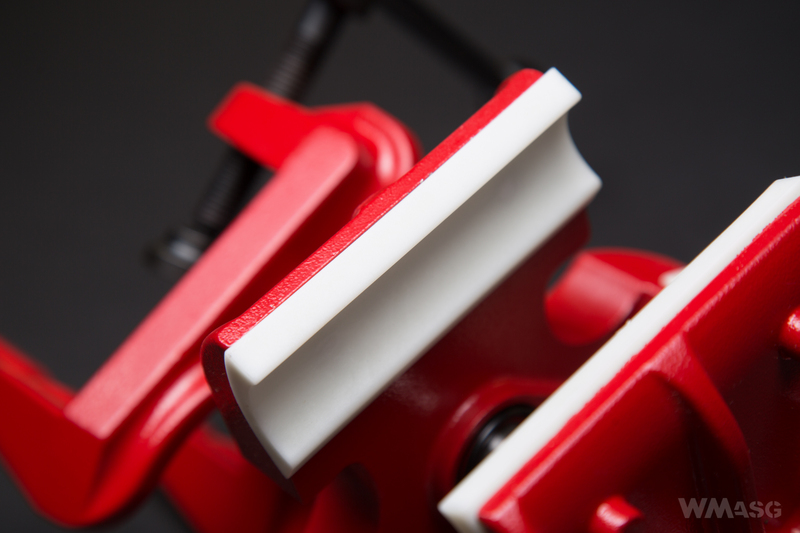 It has a very robust workbench attachment clamp and a few functions that are useful when working with replicas. Of course, this is not any kind of space technology. To paraphrase a classic: such vises can be bought in any store. But ours is red like Ferrari and made by Modify! 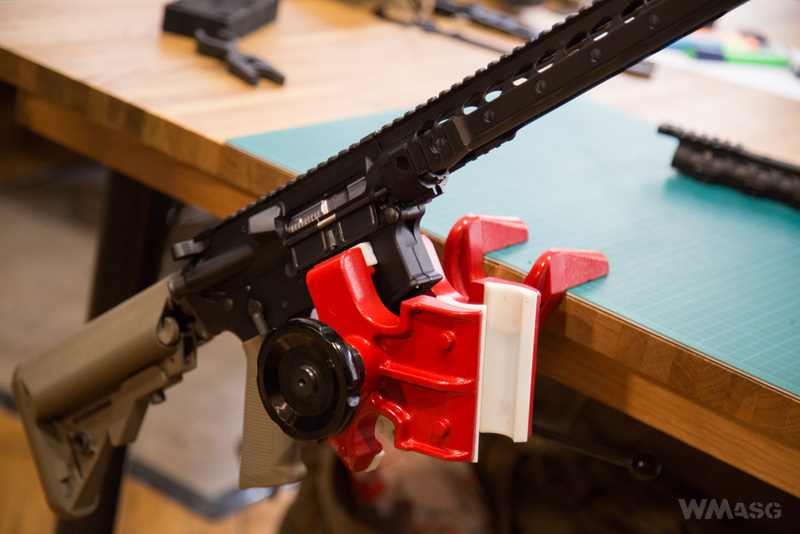 First of all - it has a large and very stable workbench attachment clamp with a convenient grip - you can tighten it with the right hand moment and your hand does not hurt. 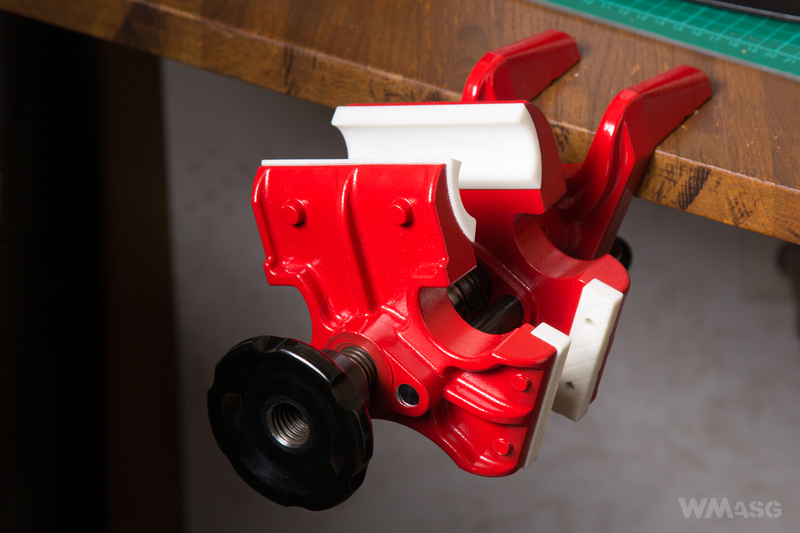 It is important for us, because in our workshop the vise is not permanently mounted - we attach it or put it away depending on the needs. Secondly - it has three pairs of jaws in various shapes and lengths equipped with replaceable plastic inserts. 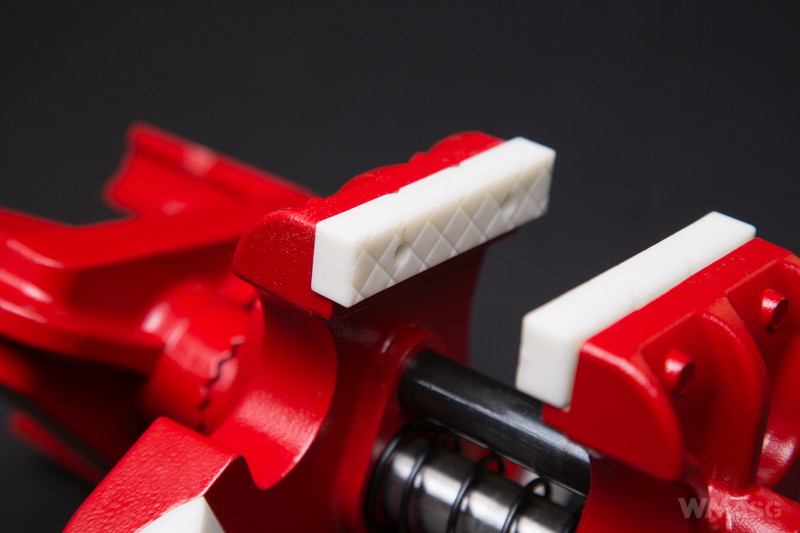 Different shape and size of the jaws gives it flexibility and the plastic inserts do not damage the fixed part. 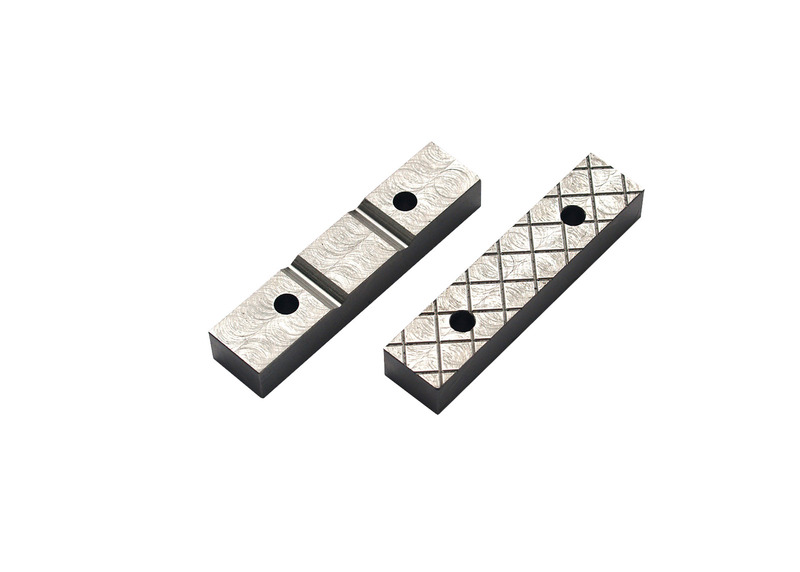 In addition, the inserts are double-sided - they differ in surface finish. An additional steel insert is also available. 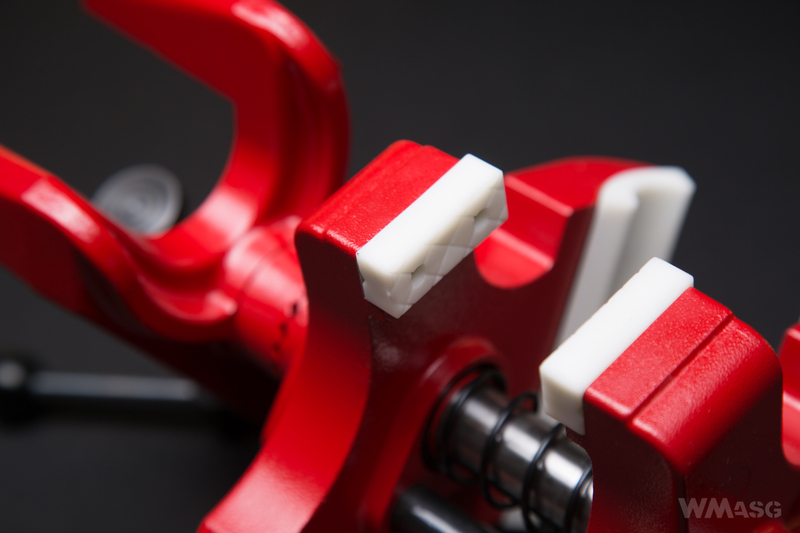 Thirdly - it has the ability to rotate the part fixed in the holder in the vertical plane. 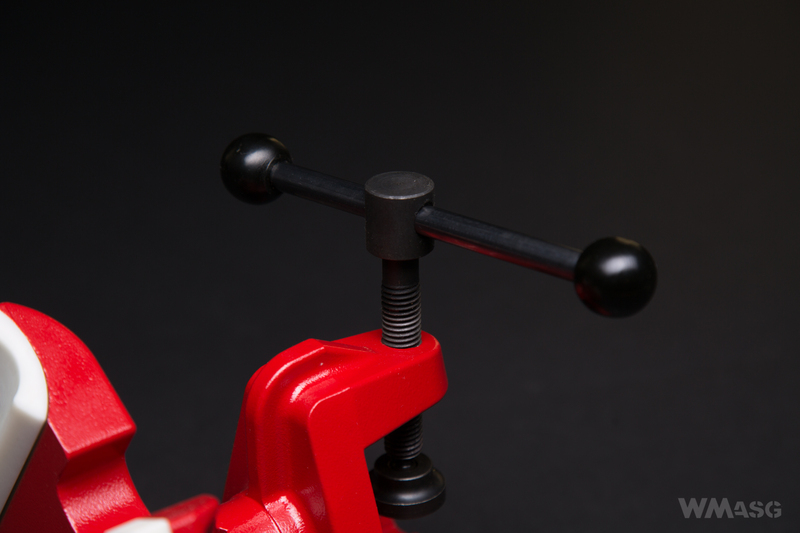 Modify did not use the ball joint that is commonly found in such vises. 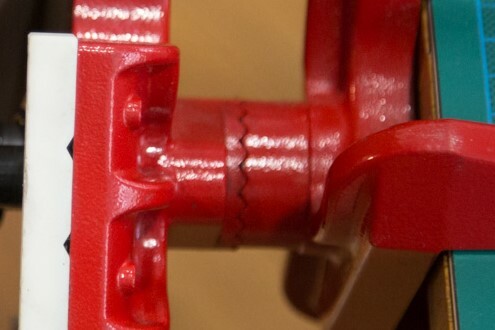 Instead, there is a spline shank connection. Hence, you can not rotate the handle smoothly to any angle. Adjustment is carried out step by step. There are 18 positions to choose from. 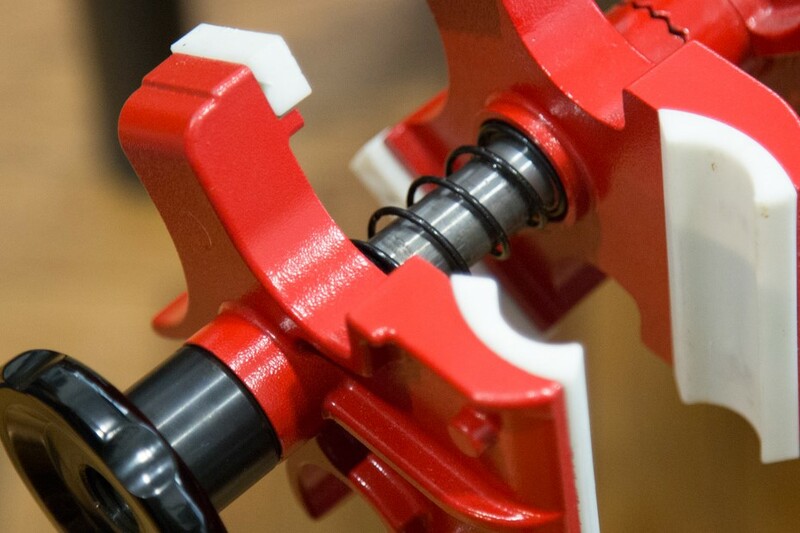 Slightly loosening the clamp allows you to rotate the head - the teeth on spline shank connection "jump" from one position to the next. And fourthly - it has a large knob and spring opening the jaws. The benefits of using a comfortable knob that does not hurt your hand are obvious. The mounted spring makes the work smoother. concave - 25 - 52 mm. Coming back to the idea, which I specified at the beginning ... The described vise is not some king of an ingenious invention. 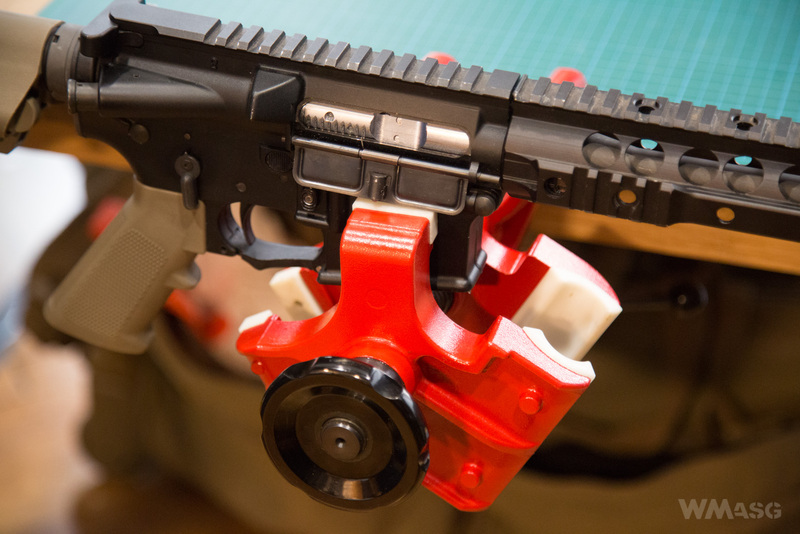 However, it is a nice little took in the manufacturer's offer of airsoft replicas and compared to other popular devices gives a bit more possibilities, theoretically dedicated for servicing (replicas) weapons. During the last year's IWA fair in Nuremberg, interest in this red vice was noticeable. Will it be held in high regard by others? Time will tell. We have presented it to show to how one can facilitate his/her your work. In our case, we choose the vise by Modify.